Taeyang World Tour - RISE in Jakarta, 14 February 2015 (personal doc). Truth is, I'm still on my hangover period, so I'd make it short this time. I still can't believe myself for (finally) being able to come to his SOLO concert. I thought, GD solo and Bigbang 'mini concert' at F1 Opening Night in Singapore would all that. 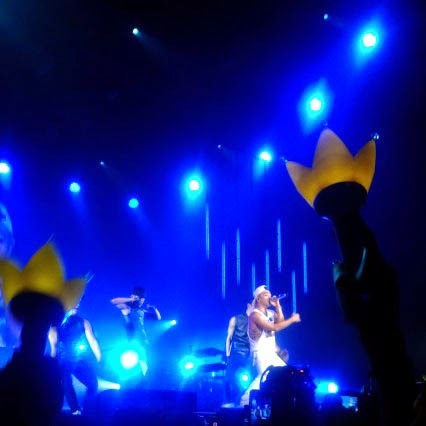 But when Taeyang put Jakarta on his list for his world tour, how could I not going? It was such an awesome performance. A flawless acts by the superstar. Details would be posted later after I'm sober enough. The feels, however, was much different from those GD and Bigbang performances I had watched before. I love either of those, anyway. What's there not to love about the boys? It's because this one superstar is my bias, there's a very subjective personal overflowing feelings while I was watching the whole show. How come that boy on stage in front of me, who sing and dance, and smile and communicate (sometimes using some Indonesian general phrases), is a real thing as well as being the same one who took my fangirl-heart away four years ago? While at the same time I was actually had loads of various things in my chest, I took the chance to just shout them all out. Of course in a sound of his name. A pretty much sweet escape, isn't he? Except for being sweeter than an escape, he is. As worn out as I might be, I was wholeheartedly satisfied. And were I happy? Well, as far as I could remember, he gave me no reason not to feel happy afterwards. Speaking back about the hangover, you see, when it was GD and Bigbang, I had the hangover right after the show finished until the next morning. But, when it comes to Dong Young Bae, the night after the show, I was surprisingly too tired for a hangover. But when I woke up at the next morning, which means this morning, I knew the hangover was just about to start and it was gonna be the hardest from all. So, the detailed notes would take the times it needed. Meanwhile : Bigbang (mini) concert checked, GD solo concert checked, YB solo concert checked.